I ski at Appi Kogen very often. It is a very good mountain. I travel from far to ski there. It takes 4 hours for me to get there, but I do it because I love it. Very very good skiing I recommend to all people. Says Suzukisan. and they are cool to take a ride with. A bit of exercise and just being on the slopes for a while will make you feel pleasant. This is a typical size ski area with an altitude difference that's in the order of average compared to other East Asia ski mountains. has a lot of ski resorts. 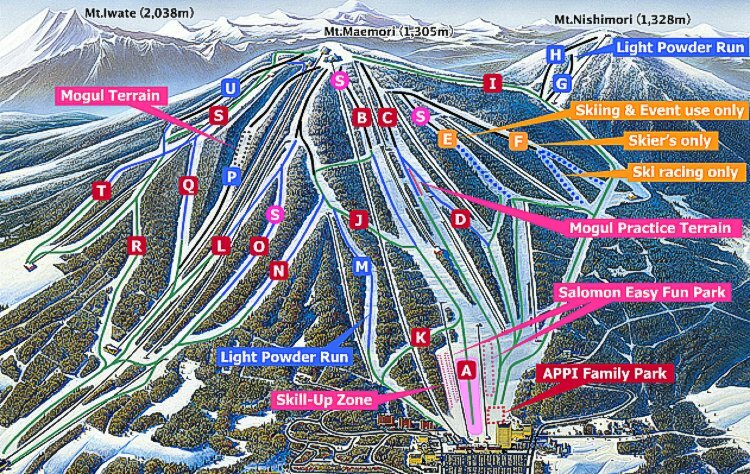 The ski run map of Appi Kogen on this page naturally says a thousand words. Appi Kogen is a delightful ski area for everybody with plenty of easy runs.